Stream anime episodes online for free, Watch One piece Episode 114 English version online and free episodes. Anime Episode guide One piece Episode 114 English dubbed Sworn on a Friend’s Dream! The Battle of Molehill, Block 4! Usopp & Chopper struggle against the Mr. 4 team’s attacks, with Miss Merry Christmas attacking from underground and Mr. 4 batting explosive balls. 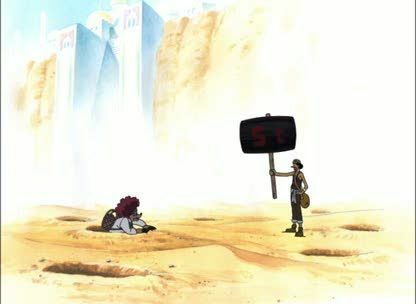 Usopp’s plan to use a fake “5-ton” hammer against the two fails after it gets destroyed and revealed as fake, but Chopper manages to trick Lasso into firing into the tunnels. When the two are still standing after that attack, Usopp attempts to flee, but Miss Merry Christmas catches him and taunts him by claiming that Luffy is dead.